Ms. Metcalf – Founder, CEO, and Board Chair of Metcalf & Associates is a highly sought-after expert in anticipating and leveraging future business trends to transform organizations. 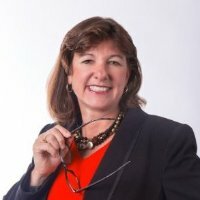 She has captured her thirty years of experience and success in an award-winning series of books which are used by public, private and academic organizations to align company-wide strategy, systems and culture with innovative leadership techniques. As a preeminent change agent, Ms. Metcalf has set strategic direction and then transformed her client organizations to deliver significant business results such as increased profitability, cycle time reduction, improved quality, and increased employee effectiveness. For years, she has been willing to share her hard-won insights – through conference speaking opportunities, industry publications, radio talk-shows, and video presentations. Leadership is a skill to be learned and practiced. Many talented professionals have become experts in their respective fields and have not yet built their skills as leaders to the same degree they have built other skills. It is through coaching and development that they will both learn the frameworks and build strong leadership mindset and skills. Ongoing coaching support combined with assessments, tailored learning, practice, and introspection build strong professionals into strong leaders. Maureen’s coaching is based on a structured process that serves as the foundation for coaching engagements and has been published in several books she co-authored on Innovative Leadership. The process starts with goal setting and quickly moves to a heavy focus on assessments. Clients explore a combination of personality type, developmental perspective, resilience and 360-feedback behavioral assessment looking at how leaders understand themselves and others perceive their behavior. This range of assessments serves as the foundation for a comprehensive development plan to support and build on leader success. She has a strong organizational consulting background so her coaching often focuses on helping leaders build their leadership skills in service of stepping into a new role or leading a transformation in their organization. She has strong university leadership experience, serving on the board of trustees of a local university, coaching, consulting and teaching at OSU. She bring the combination of academic rigor and proven organizational success into the coaching process. Building skills at the new level of leadership necessary to lead a staff 10x larger than prior staff including linking performance to strategic direction and increasing accountability for results. Outcome achieved: leader excelled in his new role. Successes included: balancing budget and resolving long standing department issues in a manner that was satisfactory to all parties. Providing tools and techniques to manage the extensive reorganization and transformation including managing diverse team and empowering knowledgeable staff to do the right thing. Outcome achieved – role became permanent meaning a promotion and more responsibility. Building self-awareness. Promotion was successful.